he Marshall University Theatre company—THEATRE ETC! (Educational Touring Company) has received an anonymous grant in the amount of $20,000. The company’s founder and director, John Colclough, professor of MU Theatre reports that the grant will do much to improve the level of production and affordability of the company’s performances. THEATRE ETC! is an educational touring company comprised of Marshall University Theatre students. THEATRE ETC! 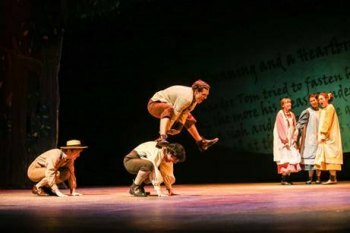 tours to and performs for middle and high schools in the Tri State area with an emphasis on stage adaptations of literary classics in an effort to support the public and private school curriculum. Past production titles include The Giver, The Adventures of Tom Sawyer, Fahrenheit 451, A Christmas Carol, Antigone, and this year’s production of 1984. In just three short years THEATRE ETC! has performed for over 3000 students throughout southern WV and eastern OH. THEATRE ETC! Offers free study guide materials, post-performance discussions and workshops in improvisation, theatre games, movement, voice, playwriting and acting. THEATRE ETC! was the brainchild of Professor Colclough and former MU Theatre Professor Nicole Perrone (now an instructor at Northern Kentucky University). The goal of the creation of THEATRE ETC! was to approach outreach in an innovative and (perhaps) entrepreneurial way—Marshall University theatre students form their own production ensemble. Under the tutelage of faculty or staff, students design and build sets, properties and costumes as well as rehearse and perform the shows. In addition to their duties as theatre artisans, students also create production specific lesson plans and study guide materials. Aside from the enormous educational impact the company has in the classroom, it is worth noting that the company provides an excellent recruitment opportunity as well, both for MU Theatre and Marshall University.